Many months ago, I stood up at the front of a large room and made a public vow to finish my bait piece by August (as in, August 2013), and it is still not done. There were at least 50 witnesses, and the whole broken promise was even videotaped. What gives? Why is my bait piece still on my to-do list instead of on my website where it can compel legions of ideal clients to give me their email addresses? My bait piece has taken so long because, even though I have absorbed a lot of useful and valuable information, I got hung up on choosing the topic: What could I write that would be valuable enough for people to give their email address? I was stuck. I’m not psychic, after all. How could I possibly know what questions and problems were keeping my prospects up at night? As part of the process, I had to learn how to figure that out. So you don’t have to get stuck like I did, follow these simple steps I learned to uncover the questions your ideal clients are asking. Then you can write a bait piece that will help you reach out to new clients with bigger budgets and projects you’ll love working on. And you won’t even have to miss your own self-appointed deadline to do it. During this whole process, it’s useful to keep an idea notebook, and develop a habit of writing down any idea that comes to mind. 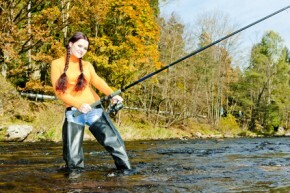 Some will make great baits; the others you can repurpose for content on your website or for your e-letters. When I was five, I loved fishing off the dock with my cousin, Andy. One day, a huge rock bass appeared in the water, and in my excitement, I threw my line in without putting a worm on the hook. Andy took his time to set the bait and he caught the fish. When it comes to developing your bait piece, give yourself enough time to come up with a great idea that will set you apart from all the other writers out there. Your bait piece should reflect your strengths, experience, and interests. Even though you’re looking for new clients, talking to your past and current clients will give you many valuable insights in how you help, and alert you to unrealized opportunities. Gather as much information as you can about the results you achieved for them. As Christina Gillick wrote in her article, How to Choose a Topic For Your Bait Piece, examples from your own client base are the best way to build credibility in a bait piece. Writing a bait piece without choosing a target market is like going fishing without deciding what kind of fish you would like to catch; you won’t know whether to bait your hook with a worm, a fly, or a small fish. Remember, nothing you do here is set in stone. You don’t have to define yourself as a writer and person for now and evermore. Instead, just focus on selecting a group of people you’d like to serve. This decision makes it possible to concentrate your marketing efforts on a defined group of people. If you have more than one target market in mind, prioritize them and focus on the best opportunities first. Rank them according to how much money you can make if you worked for them, how well your skills match their needs, and how easy they are to contact. The best way to find out what is important to your prospects is to go where they are, whether online, in print, or in person. If your target market has a professional association, go to a meeting and read their publication. If they have a LinkedIn group, join it. Attend a networking event in your area, and volunteer to do a job that requires you to talk to a lot of people. Once you’ve made contact, compile a list of questions that potential clients are actually asking and problems they face. When you are targeting businesses in a field where you have a lot of personal experience, you will notice where improvements can be made. For example, I recently came up with a free report topic just by keeping my eyes open. I play trumpet in community orchestra where they put a lot of effort into raising money. Their biggest fundraiser involves over 100 musicians, a dance contest, a silent auction, food, and countless stuffed animals for sale. The profit for this elaborate event was under $5,000, which made me want to write a bait piece on how community music groups can raise more money with less effort. Opportunities like this one exist in every industry. You just have to keep your eyes open to them and be willing to ask people questions. Choosing a topic for a bait piece is a decision that should never be made in isolation. All alone, I agonized for months trying to come up with a topic that would interest my target market, and came up with nothing. But when I browsed through the comments in a relevant forum on LinkedIn, topics were laid out on a silver platter. Many of the questions that are posed in professional forums can be answered in a special report, podcast, or video, and used as a bait piece. Look for questions you can answer well, where your answer differs from the norm, demonstrates your way of looking at the world, or where there’s a knowledge gap. Look for areas where your prospects can make more sales, generate more leads, or increase their search engine rankings. Scan the customer feedback section to find clues to where businesses may be falling short. When you spot a problem, write a report explaining the solution. Once you’ve written your bait piece, you’re not finished. Expert writers come up with new reports, books, webinars, and podcasts on a regular basis. So should you. After thoroughly investigating your target market, you will have a long list of questions that need to be answered. Fantastic! Simply answering those questions will lay a solid foundation for your content marketing plan for the year. Every month, plan to create at least one piece of valuable content that will attract potential clients. And then continue to collect and prioritize your ideas and put them in your schedule. Decide how to present each idea. Should it be a blog post, an interview, a downloadable e-book, or a webinar? Once your bait piece is in place, any additional content you create will drive traffic to your site, expand your reach, nurture your prospects, and grow your business. Having a bait piece is an essential part of building an email list of prospects to market to — creating important opportunities for your business. Figuring out the right bait piece topic doesn’t have to be as difficult as I made it for myself in the beginning. Once I implemented these four steps, I had more topic ideas than you could shake a stick at. And that puts me in a position of strength when it comes to content marketing. It can do the same for you. This article is so helpful. It’s opened my eyes and helped me see past a place where I’ve felt stuck and overwhelmed. Thanks!